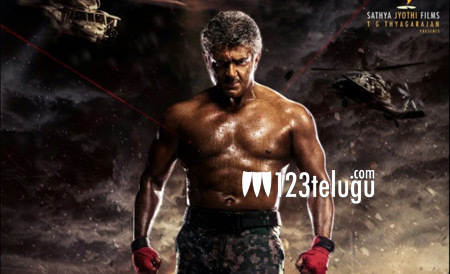 Tamil star hero Ajith’s forthcoming flick Vivegam’s first look posters have created a lot of curiosity among his fans and moviegoers. The film is in its final leg of shooting and the makers are planning to release the first teaser on May 1st. Meanwhile, an interesting news is that the film’s music album will have five songs and the producers are planning to release the audio album along with theatrical trailer in July. We can expect an official announcement from director Siva’s Twitter handle tonight at 12 am regarding the same. Music sensation Anirudh Ravichander is scoring music and Kajal Aggarwal will be seen as the female lead in this action entertainer, which is scheduled for August 10th release.